Kalevi Aho’s remarkable music for organ was aired via the BIS label in 2013 (see review), and as some of the recordings on this album share the same recording date and venue as the previous disc this can almost be seen as volume 2 of a pair. Quasi una Fantasia is for horn and organ and is the most recent work here, and the composer’s most extensive in a ‘chamber music’ setting. Aho describes the pieces as “extremely virtuosic, and almost concerto-like in nature”, and indeed one could perhaps imagine the organ substituted for an ensemble of some kind. The organ part is more sparing than with some of the solo works, making the piece more immediately accessible. There are some moments which are reminders of names such as Hindemith, but with some striking quarter-tone effects from the horn and Aho’s sense of organic development and earthy pragmatism the work has plenty of individual character and originality. Epilogue is Aho’s first work for organ and soloist, this time responding to a request from trombonist Christian Lindberg. This is a gorgeous little piece which restricts itself for the most part to the lyrical qualities of the trombone. Brass instruments and organ combine very effectively, and the soloist moves over a rich harmonic accompaniment like a sleek aquatic craft carried on waters both serenely smooth and darkly troubled. J.S. Bach’s incomplete Contrapunctus XIV from Die Kunst der Fuge has been the subject of fascination for many composers over the years, and Aho’s completion was made for organist Jan Lehtola’s as part of his performances of the complete Art of Fugue. If you are tuned to the original you will hear Bach turning into Aho at 10:23, but in maintaining Bach’s idiom and creating a very effective and suitably complex culmination which manages to combine all four themes this is a remarkable achievement which may or may not have the great musical ancestor nodding in approval from on high. The only problem with this performance is that it is treated as a pretty full-on and fitting culmination of Bach’s late masterpiece, and lifted out of context it sits a bit strangely amongst Aho’s other work, but this does not diminish the ambition and extraordinary effect of this meeting of musical minds. The two Wedding Marches were Aho’s first organ pieces, and as occasional works they provide a festive touch and an atmosphere of refinement to proceedings, though not without the composer’s characteristic harmonic individuality. Ludus solemnis was written for the inaugural concert of a new organ in Aho’s home town of Forssa. This was conceived and composed before the instrument was completed, so became an ‘orchestral’ exploration of the organ’s registers, range and dynamics. Full of grand gesture and spectacular sonorities, this is indeed a work-out for any organ, and sounds grand on the Åkerman and Lund instrument in Malmö. In opposition to this, the enigmatic In memoriam was written for a small organ. This was composed for the funeral of author Juha Mannerkopi, using the letters of the name to build musical material. The work has a sombre atmosphere as you would expect, but also has a pretty defiant core as well. The beautiful Song of the Earth is also funeral music, composed for Aho’s father’s funeral in 2002. The combination of oboe, violin and organ is remarkably transparent, and the poignancy of the music is unmistakable. 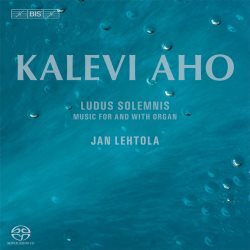 Easier to digest than the large scale Organ Symphony, this release is yet another triumph for Jan Lehtola and his colleagues and should be snapped up by Aho fans without delay. Bis’s excellent SACD atmosphere is a real treat, adding realistic dimension to an already superb stereo mix. With its combination of miniatures and grander masterpieces this is an organ disc which I hope will find appreciation by a very wide audience indeed.